Hello my friends. Today I am sharing a double-page layout that I made for week 4's personal challenge. 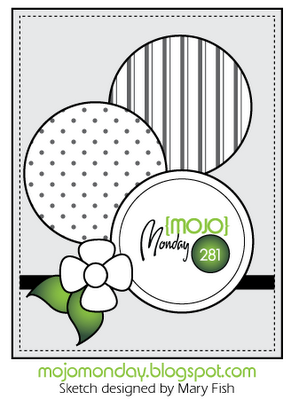 Kellie challenged us to make a card or layout that consisted of 2 patterned papers or stamped papers and some stitching, either hand stitching or stamped stitches. So here is my layout that I created. 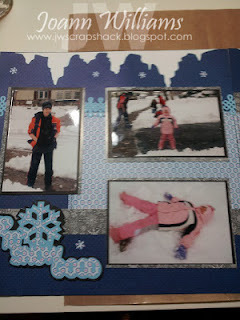 I decided to do a layout of my children playing in the snow from February of 2008. Yes i'm that behind in scrapbooking LOL. I used 3 patterned papers all from Recollections and 3 solid cardstock papers from Bazzill. 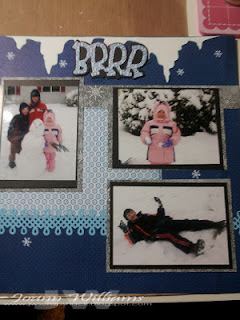 I used my Pazzles inspiration machine to cut the title that says, "Up to Snow Good", a subtitle "Brrr" and the icicle border across the top of the pages. 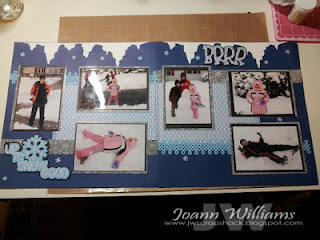 I also used my Martha Stewart snowflake punch for the snowflakes and I used another one of her punches called trim loop to make the baby blue borders. I used a stitch stamp by Papertrey Ink and stitched around the blue/pink patterned paper in black momento ink. Here are closer pics of the layout. The left side of the layout. The right side of the layout. If you would like to get in on the challenges with us, we would love to see your creations. If you do play along, please link back to our blogs. This has been a fun month and I am looking forward to seeing what Kellie cooks up for us next week! Have a wonderful day!